SINGAPORE - Home Affairs and Law Minister K. Shanmugam on Sunday (Sept 1) questioned historian Thum Ping Tjin's meeting with Malaysian Prime Minister Mahathir Mohamad, describing the conduct of the Singaporeans involved as "a little sad" and "a bit regretful". The group that met Tun Dr Mahathir in Putrajaya on Thursday included former student union leader Tan Wah Piow, Dr Thum, freelance journalist Kirsten Han, comic artist Sonny Liew and activist Jolovan Wham. They also invited Dr Mahathir to open a conference next year on the issue of opening up democratic space in South-east Asian countries. Asked about the meeting at a community event at his ward of Chong Pang, Mr Shanmugam said: "We can have political differences within Singapore. It is the people's right. "But I think we should never go out and invite someone foreign, a foreign politician, to intervene in our domestic politics. I think that's an absolute no no." After the meeting, Dr Thum made a Facebook post saying he had asked the Malaysian leader to "take leadership in Southeast Asia for the promotion of democracy, human rights, freedom of expression and freedom of information". Commenting on the post, Mr Shanmugam said: "I think it is quite clear what that means." 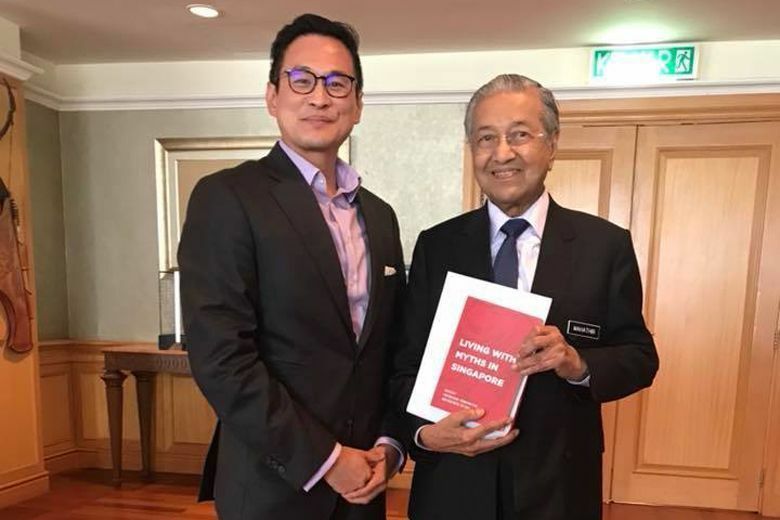 Dr Thum Ping Tjin met Malaysian Prime Minister Mahathir Mohamad in Putrajaya, on Aug 30, 2018. The minister's comments came a day after Marine Parade GRC MP Seah Kian Peng questioned Dr Thum in a Facebook post for suggesting that Singaporeans should also rejoice on Malaysia's independence day, among other things. Mr Seah added that "it appears quite clear to me that PJ Thum does not wish Singapore well". Responding in a blog post that same night, Ms Han said Mr Seah appeared to have misunderstood the nature of the meeting with Dr Mahathir. On Dr Thum's post, she said: "PJ did not say that he asked Mahathir to bring democracy to Singapore, nor did I hear him say such a thing during the meeting." She also said that Dr Thum's "happy unofficial independence day" wish to Singaporeans was not about declaring Singapore a part of Malaysia, but a reference to the Republic's history. She noted that founding Prime Minister Lee Kuan Yew declared independence from the British on Aug 31, 1963. In response to her post, Mr Shanmugam said: "Kirsten Han then puts up a post saying that that is for South-east Asia and not Singapore. Where is Singapore if it is not in South-east Asia? Do we need a geography lesson? "And you know, we are not saying anything about Dr Mahathir but I think one needs to be careful about these things. And now to try and explain away what is so obvious, that doesn't do them much credit either." The minister also noted that Dr Thum and Ms Han tried to register a company, OSEA Pte Ltd, earlier this year. "PJ and Kirsten are partners in a company they went to set up, which has taken foreign money, to also promote democracy, human rights and so on in Singapore, so this is not new. And I think it is all a bit sad," he said. The Accounting and Corporate Regulatory Authority (Acra) had in April rejected the application to register OSEA Pte Ltd on the grounds that the registration would be contrary to Singapore's national interests. Acra said that the purposes of the proposed company were clearly political in nature and had links to foreign funding from a group led by billionaire George Soros, which was set up to pursue a political agenda worldwide. In a Facebook post on Sunday afternoon, Ms Han said Mr Seah's allegations have triggered a torrent of accusations of treason and death threats. She reiterated that his statements were "baseless" and called on him to retract them. In a separate Facebook post, former political detainee Teo Soh Lung also urged Mr Seah to remove his post. Mr Seah had flagged a comment that Ms Teo posted about a video of a forum on The Online Citizen's Facebook page, in which she wrote that "Singapore is part of Malaya la". On Sunday, Ms Teo wrote a lengthy post in response and questioned what was wrong with the statement she made when taken in context.